Eugene Holman Jr., known to his many friends as “Gene,” passed away suddenly on March 4, 2013, of a defective heart while walking his dog, Remy, in a lovely area near his home in Townsend Gulch. Gene was born in New York City on March 29, 1933, to Eugene and Edith Reid Holman. He was enrolled in Manhattan’s Albert Stevenson School until age 13 and then attended Deerfield Academy in Massachusetts. Upon graduation, he went to the Agricultural School at Cornell University and graduated in 1955. Shortly thereafter, he married Antonia Pew, with whom he had three children: Tina Reid, Eugene III (“GG”), and Thomas William. During the first three years of their marriage, Gene and Antonia lived in Laredo, Texas, where Gene was an Air Force lieutenant instructing pilots. 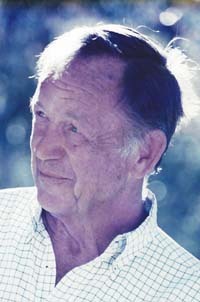 Upon finishing with the Air Force, Gene and family moved to Venezuela where Gene worked for Nelson D. Rockefeller on the Rockefeller Ranch. Returning to the United States, Gene bought 1,500 acres near DeQueen, Ark., and created the Rolling Fork Ranch, where he bred Brangus cattle (a sturdy hybrid of Angus and Brahman cattle). After almost 10 years of ranching, the family moved to Nairobi, Kenya, where he had been offered a position as bush pilot for Wings For Progress, flying missionaries, doctors and medical supplies to the far reaches of the Kenya bush country. While there, he set his eyes on a ranching project in Madagascar, enlisting the aid of Winthrop Rockefeller. Gene’s plans fell through due to that country’s government coup. Upon his return to the United States, Gene and Antonia divorced, and Gene settled back into life at Rolling Fork Ranch as a single man, enjoying his beloved garden and cattle. In 1975, Gene and Carol met in New York City at a Knicks game. Carol had moved from San Francisco to New York where she worked for the architectural firm of John Carl Warnecke. What began as a blind date soon flowered into a romance, and in 1976, Gene and Carol were married at the Rolling Fork Ranch. Seasonal climate extremes forced them to spend half the year on the ranch and the other half in New York City. Their eldest son, Patrick, was born in 1977. In 1979, they sold the ranch and moved to Shreveport, La., where Gene immersed himself in the oil business, a career that his father, former CEO of Standard Oil (now Exxon), had often encouraged him to pursue. Their second son, Jamie, was born in 1980 in Shreveport. In 1989, the Holmans moved to Sun Valley and settled in Gimlet where they remained for 15 years before buying the multi-acre property in Townsend Gulch south of Bellevue, which the family now calls home. Here Gene’s life centered around vegetable gardening, fly fishing, hunting, golf and his growing family. Gene is survived by his wife, Carol, and their sons, Patrick (Marianna) and Jamie (Elizabeth); his three older children, Tina, Gene III (Christha) and Tom (Shelley); his sister, Cathie (“Pitch”) Johnson, and their children, Franklin, Leslie, Martin and Reid; and his seven grandchildren, James, Reid, Isabella, Taylor, Arian, Tara and Nicholas. Services were held at St. Thomas Episcopal Church on Friday, March 8. The family requests that donations be made in Gene’s memory to Higher Ground (Adaptive Sports) or The Hunger Coalition.